BULAWAYO, May 22 2012 (IPS) - Gertrude Mkoloi earns a living harvesting maize on a small piece of land in rural Zimbabwe. Or at least she used to. 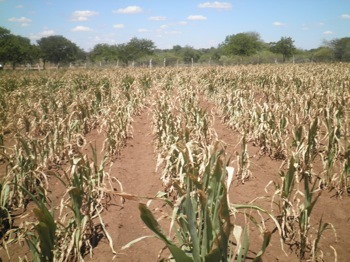 Deep in rural Binga, more than 400 km from the country’s second-largest city, Bulawayo, Mkoloi stared blankly at her maize crop, scorched brown by the sun during what was meant to be the rainy season. “This is what I have for my labour,” she said, pointing to charred maize stalks that failed to grow tassels – a cluster of male maize flowers required for pollination. “No one here tells us anything about planning for the cropping season, but what we know is that the rains have shifted,” she said. It is a common complaint among women farmers in this southern African nation, as the bulk of local agriculture remains rain-fed. According to the Meteorological Service Department, rainfall across the country has declined, while temperatures have risen in the past few years. And this has meant that the traditional agricultural seasons have shifted. 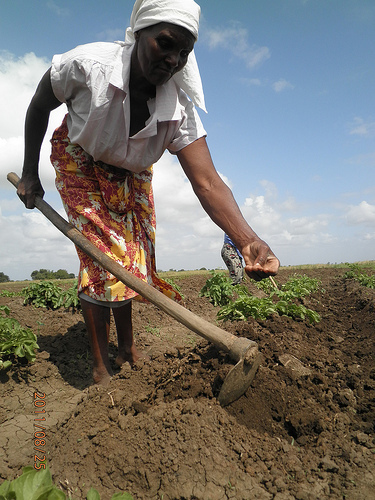 Rural women, who according to the Ministry of Agriculture make up more than 70 percent of food growers here, have experienced failed harvests in recent years due to radically changing rainfall patterns. In April, Minister of Agriculture Joseph Made announced that this year’s maize harvests had shrunk by 26 percent, due to poor rainfall. And the government has already warned that food insecurity could lead to fatalities. In another southern African country, Angola, millions are facing critical food insecurity as a prolonged dry spell across large parts of the country destroyed harvests and killed off livestock in the first three months of this year. Up to 500,000 children are now thought to be suffering from severe malnutrition triggered by the collapse in food production. And the situation is likely to worsen. The United Nations’ Food and Agriculture Organization has predicted that challenges posed by climate change will result in reduced agricultural yields in sub- Saharan Africa by between 20 and 50 percent by 2050. But female subsistence farmers like Mkoloi, who according to the Alliance for a Green Revolution in Africa make up more than 70 percent of farmers on the continent, remain clueless about climate change issues. And there is little or no government intervention in Zimbabwe to aid them. Hazel Gumpo, a smallholder farmer affiliated to the Zimbabwe Commercial Farmers’ Union and a gender activist, said that more needed to be done to educate women about the changing climate. “There is no doubt in my mind that women are feeding the nation through farming activities. But there is very little or no knowledge sharing for us to understand and deal with the impacts of climate change,” Gumpo said. It is one of the reasons there are growing calls for southern African countries to urgently adopt a gender perspective as an aspect of climate change policy. Gender Links, a southern African non-governmental organisation focusing on gender equality, plans to lobby for the approval of an addendum to the Southern African Development Community (SADC) Protocol on Gender and Development. The protocol is a regional instrument that advances gender equality and women’s rights. While the protocol does not mention climate change specifically, it has provisions that can be used to advance a climate justice agenda. For example, Articles 12 and 13 are about governance and providing for the equal representation of women in all spheres of decision-making. The preamble of the protocol underlines the need for the elimination of gender inequality in the region and the promotion of the “full and equal enjoyment of rights” and Gender Links argues that the same set of demands can be fought for within the climate change debate. “Women’s voices and interests need to be amplified in the policy-making around climate change, not least because they are the most vulnerable to climate change because of their different social roles and status,” Gender Links argued. Many hope that the addendum will be ratified at the SADC Heads of States Summit in Mozambique in August. The climate change addendum will seek knowledge empowerment for women, especially those in rural areas. And it is something sorely needed in the region, analysts say. “There is still a lot to be done as far as empowering rural women in the region goes,” said Nonhlanhla Siziba, a gender policy researcher in Bulawayo. “At least adopting climate change policy issues concerning mitigation measures at that level could mean that governments like Zimbabwe are compelled to work closely with subsistence farmers,” Siziba told IPS. “That SADC is being pushed to adopt it now as a policy issue aimed at addressing and improving women’s livelihoods is a step in the right direction. It is also important that this comes at a time when Zimbabwe is formulating its own climate change policy,” Mhlanga said. But it could still be some time before subsistence farmers like Mkoloi reap the benefits. Meanwhile, Mkoloi has no option but to go ahead and plant her crop for the next season. However, her burnt field of maize is a stark reminder of the uncertain future she faces. “We are already planning to prepare the land for the next planting season. But we still do not know when the rainy season will start in light of what happened last time,” Mkoloi said. *Additional reporting by Busani Bafana in Bulawayo.